Lake Lucerne is the fourth largest lake in Switzerland after Lake Geneva and Lake Bodensee. It is situated between Germany, Switzerland and France, Lake of Zurich, Lake Neuchâtel is the longest lake within the entire country. Lake Lucerne is known as Lake of the four cantons. Is situated in central Switzerland. Its surface area covers 114sq.km. and its depth reaches 214 m.
Water volume Lake Lucerne amounts to 11.8 cubic km. This body of water is located within the cantons of Uri, Schwyz, Unterwalden and Lucerne, and on its coast is the picturesque town of Lucerne. Lucerne is located on the northwestern shore of the lake. A small, quiet town with narrow cobbled streets and covered Bridges. The old town center is charming with its painted houses that have long been a charming place for many tourists from around the world. Lucerne was once a simple fishing village but today is a charming town that lies on both banks of the river Reus, at the west end of Lake Lucerne. It is located 54 km from Zurich, Which is the nearest airport. It is the lake that turns Lucerne into a popular resort, which grows each year. There are numerous opportunities for recreation and entertainment. Many point Lucerne out as one of the most beautiful towns not only in Switzerland but also throughout Europe. Much of the coastline of Lake Lucerne consists of hills, which rise to 1500 meters above the lake surface. This is a prerequisite for the many beautiful natural scenes, including those of Mount Rigi and Mount Pilatus. On the south coast of Lake Lucerne is the meadow Rütli, which is considered the heart of Switzerland. Along the coast there are many of the oldest communities in the country, Küssnacht, Weggis, Vitznau, Gersau, Brunnen, Altdorf, Buochs and Treib. Lake Lucerne’s Panorama offers unprecedented diversity to the beauty of Switzerland. 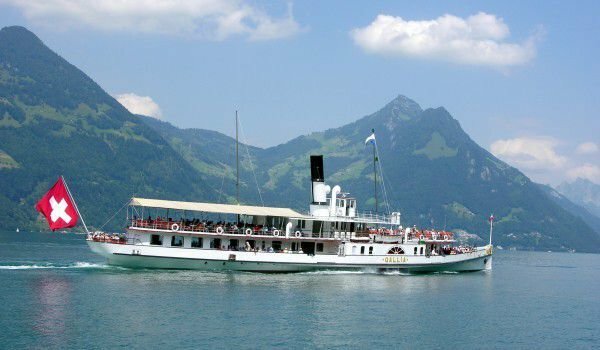 Visitors here have the opportunity to board a small cruise, in the warmer summer months as well in more severe weather, when the mist gives Lucerne a certain mystique. Even the name of Beethoven's Moonlight Sonata was inspired by a scripture in the light of the moon, which reflects the crystal surface Lake Lucerne.